Frigga’s Day, March 23: Spring’s here, and there’s no better time for a concert under the trees. In our case, they’re ashes and pecans plus lots of understory plants to fill in the spaces between. 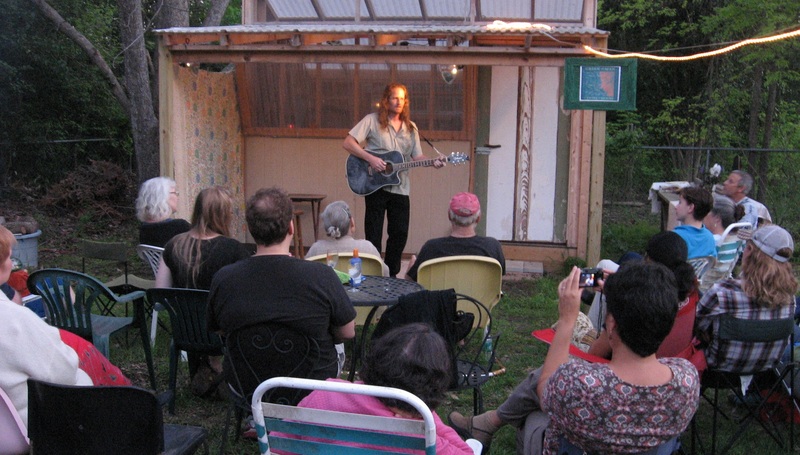 Sonically, our ears were filled this past weekend with the tunes, lyrics, and rhythms that Dale Barnard brought to the Backyard Theater. I’ve know Dale for at least a decade. He’s been a faithful and active member of our Austin Ishmael Dialogue, and he and spouse Denise are long-time denizens of Camp Patchouli at Kerrville. This night also honored Denise on her birthday. Among other subjects, Dale’s ditties relate his concern for the planet and our culture’s role in its care. Because he’s also a writer, his chooses his words carefully and thoughtfully. His other passion is spelunking, so much of the repertoire deals with crawling in holes underground. In fact, about half the audience were cavers, most new to the Green Man. Special guests included Dale’s mom, Carol (to whom he dedicated a song), and Denise’s mother, Jo. Our growing family of revelers added a three-month-old child, as well. Friends, neighbors, and country folk all joined in their appreciation. It may have been the best-attended event we’ve done so far. Too, the pot-luck feast was particularly sumptuous: carrot cake with candles, multilayered cheesecake, garden-fresh greens, wine and Shiner beer, chips, and fancy dips. No one left hungry. I often attend Green Man gatherings, but this time was very different and great fun! 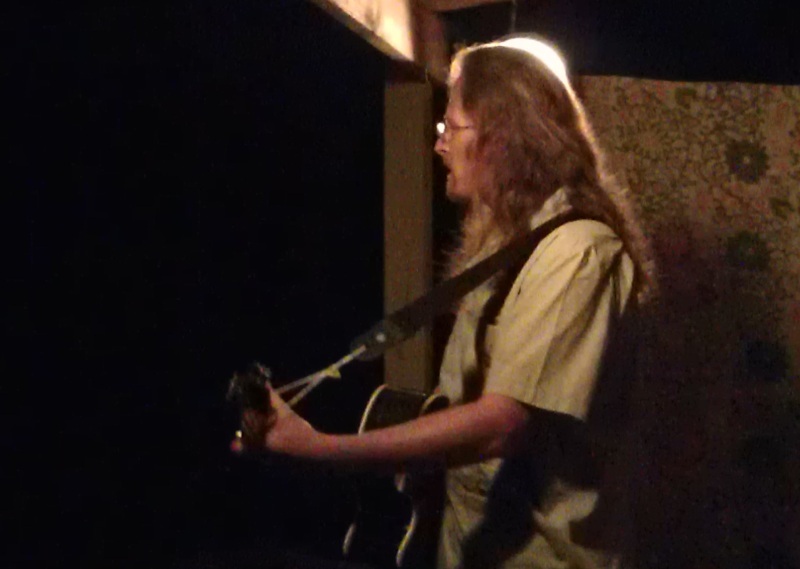 I enjoyed getting to share my music again. Thanks to hosts Howie and Linda.